Cost: $5 pp | Who: All ages, drop-ins welcome! 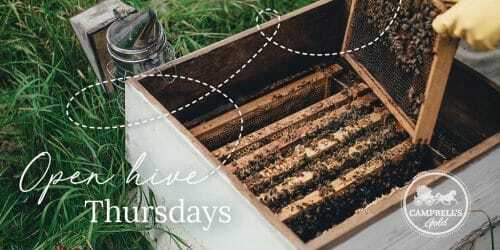 Adventure with Master Beekeepers Mike and Judy Campbell, and their daughter Jenny, into live hives and watch their beekeeping activities. We will provide a little theory, but mostly this will be a time that you follow along with the beekeepers on whatever their beekeeping routine is for the day.